Intelligent Resilient Framework (IRF) is HP's switch platform virtualization technology, which allows us to create one logical switch from two or more physical switches. It was originally developed by H3C, which was a joint venture between Huawei and 3COM (later on entirely taken over by 3COM) and become part of HP after 3COM's acquisition in 2010. This technology generally is analogous with Cisco's VSS and vPC technologies, although it is independently developed and uses proprietary protocols (Cisco's VSS and vPC are also different, but that's topic for another discussion). Fast failure convergence time, which in the case of IRF is below 40miliseconds. 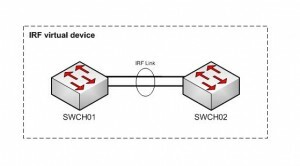 Ability to span LACP aggregated links over multiple physical switches and benefit from the higher throughput and the higher availability. Drastic simplification of the network topology, which is achieved by the reduction of unused backup links. Simpler management of a single logical device, in contrast of managing multiple physical devices. 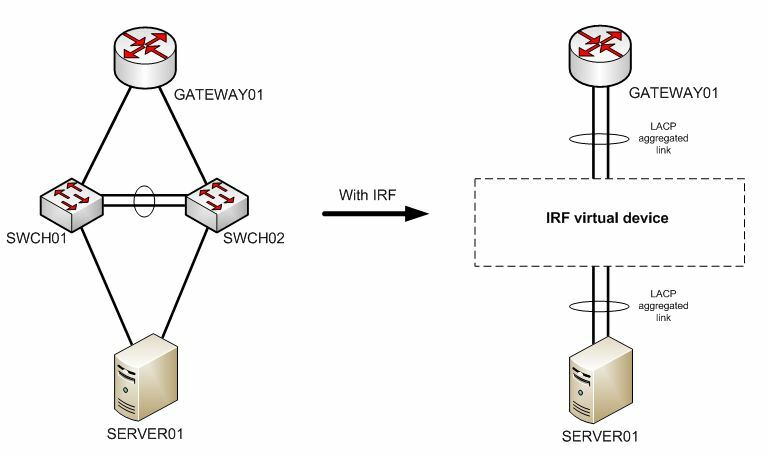 To create an IRF virtual device we have to connect members together through an IRF link. 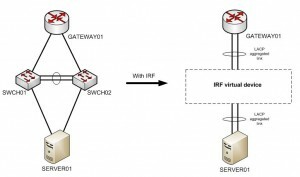 This link is created between 2 logical IRF ports, which are associated with physical ports in the member switches, that are going to form the IRF virtual device. Master - responsible for management if the IRF virtual device. Master role is assumed only by one member of the IRF virtual device at a time, and there couldn't be more than one. In case of master failure, automatically a new master is being elected from the available subordinates. Master election process could be influenced by priority value, which could be set at the IRF virtual device member switches. The higher priority is more likely to become a master and the default priority on all switches is 1. In order to distinguish the members in an IRF virtual device member ID value is being used and additionally all members of the IRF virtual device are part of a single IRF domain, which is being distinguished by unique domain ID value, which by default is 0. A recommended approach is to change the default value to a different one, which is the same on all member switches, because otherwise the LACP MAD descision process cannot function properly. Additional IRF and MAD information could be read here, including advanced configuration instructions. 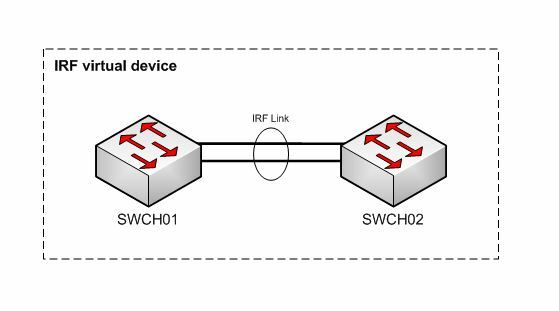 The following platforms are supported for IRF implementation: A12500, A10500 A9500, A7500, A5820, A5800, and A5500 series switches. These products could be used for access, distribution and core layers of the network. For additional information: read more here.